Introduced by the Southern Railway some of these vehicles surived into rail blue and hung on until the mid 1970s. The kit builds a TPO sorting van and includes etched sides, floor and solebars, plastic roof and ventilators, white metal ends and detailing as well as brass buffers. You will need a pair of suitable bogies (N Gauge Society SR steam bogies or UM567 etched SR 8ft steam bogies), paint and decals. The underframe is designed to be soldered but it is possible to build an underframe using glue only (instructions on how to do this are included). Some work is needed trimming the roof to shape and modifying the supplied LMS ends to SR style. A small amount of filling is necessary on the supplied roof. Introduced by the Southern Railway some of these vehicles surived into rail blue and hung on until the mid 1970s. 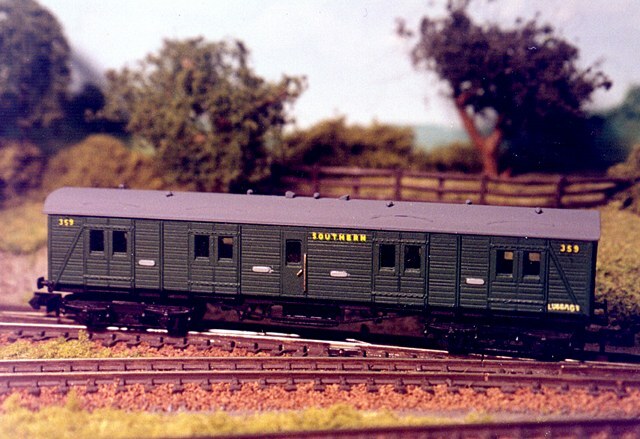 The kit builds a TPO stowage van and includes etched sides, floor and solebars, plastic roof and ventilators, white metal ends and detailing as well as brass buffers. You will need a pair of suitable bogies (N Gauge Society SR steam bogies or UM567 etched SR 8ft steam bogies), paint and decals. Introduced in 1937 these vans saw mainline service until 1986, when the demise of newspaper traffic left them surplus. Many passed into departmental use and several are preserved. The kit consists of an etched fold up shell, solebars, footsteps and detail overlays, white metal detailing parts, screws, vents and plastic roof and ventilator mouldings, You will need to provide paint, glue, solder and suitable bogies. N Gauge Society SR steam bogies can be used or an etched SR steam bogie (UM567) is available. These vans were first introduced in 1928 on ex LSWR underframes. The kit is based upon diagram 3098 and represents a batch of 30 built in 1930. It also includes the alternate central doors with windows that were fitted to some vans from 1945. Most of the vans were withdrawn around 1959/60 but a few remained on pigeon traffic until 1961. A few survived into engineering use, having the gangways removed. The most famous of these vans was 2464, which was painted in a pullman livery and used for Winston Churchill's funeral train. The kit contains a fold up etched body with integral floor, etched door overlays, strapping, grilles, footboards etc. A plastic roof with etched overlays, torpedo ventilators, cast detailing parts, wire and glazing. You will need to provide a suitable pair of bogies. Choices include the N Gauge Society SR steam bogie or the Ultima etched SR steam bogies (UM567). Introduced in 1928 thirty of these vans were built in three batches. They survived into the late 1970s as GUV vehicles and several went on to departmental use - including on the Chipman weedkilling train. Three are preserved. The kit consists of an etched fold up shell, solebars, footsteps and detail overlays, white metal detailing parts, screws, vents and plastic roof and ventilator mouldings, You will need to provide paint, glue, solder and suitable bogies. N Gauge Society SR 8' steam bogies can be used or an etched SR steam bogie (UM567) is available.